Head for the beach and the deep blue sea for hours of fun. Put on some imaginary sunblock and a make-believe hat, kick off your shoes, and let's go! 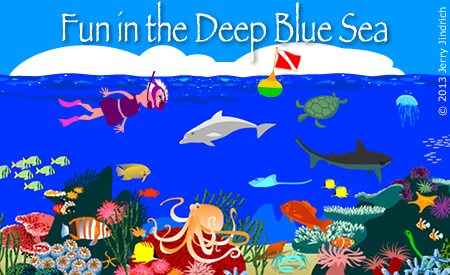 Swim over a colorful coral reef. Dive in a min-sub. Learn about sea shells. See videos of different ways animals get around in the ocean. And More! Young artists will find lots of inspiration in our Spring Colors collection of 59 flower photos! Young naturalists will enjoy them, too. Use this magic egg carton as a gateway to more Easter Egg-tivities including an interactive Easter egg hunt. Frogwart's patient pet spider will show you how to make each letter of the alphabet as often as you like. ... . ... Have fun with fruits, vegetables, colors and baby crocodiles. Ride a wave with Itsy Bitsy Spider. Discover what else happened when the cow jumped over the moon. Enjoy 3 different age-appropriate versions of six classic rhymes. Create your own. Encourage creativity by having your child dictate or write endings for our Story Starters. ... . ... Understanding spatial concepts is much easier with a little help from our collection of critters. There are even some animals to print and move around the house. Our riddles give clues about 20 different animals. Can you guess them all? Help us identify and count animals. Join us for an amazing trip to the circus! 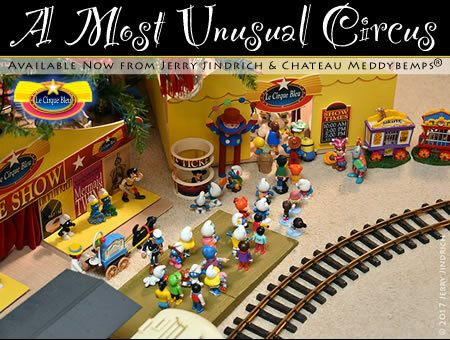 In 1996, we introduced you to Le Cirque Bleu, a little circus made from a few toys and some ordinary art supplies. Since then, we bought a few more toys and we took some new pictures. You should take a look. You might be inspired to create your own little circus (with lots of opportunities for learning and family or classroom fun). © 2001-2019 Jerry Jindrich. All rights reserved.